Kicking off a short season of Irish plays at the Clapham venue, To Have to Shoot Irishmen is the latest work from Lizzie Nunnery. Produced by Almanac, Nunnery’s female-led theatre company, the play is inspired by the story of Irish writer and activist Francis Sheehy-Skeffington, who was killed by the the British military during the Easter Rising in Dublin in 1916. The beauty of Nunnery’s storytelling technique is her use of original songs to deepen the emotional heft of the story. Nunnery and composer Vidar Norheim fuse simple percussion and strings to create an Irish folk sound, and the lyrics are rich in historical detail. Skeffington’s story unfolds as a fragmented narrative, exploring his relationship with a guard while in custody as his wife Hanna is confronted by a sympathetic British officer. Themes of national identity and the legacy of military action provide the backdrop, but it’s the individual stories that really hit home. 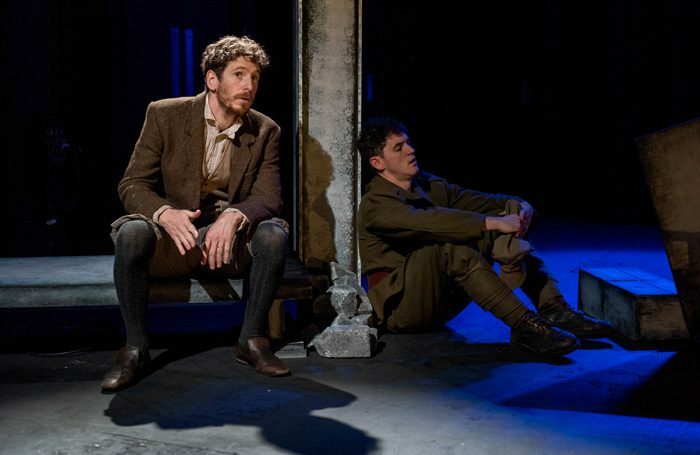 Gerard Kearns makes a loquacious and persuasive Frank, coaxing his guard into thinking for himself but it’s Elinor Lawless as Hanna who owns this production. Her pain, as a young widow and mother brings a rww edge to the play and her horror, wandering through the war-torn streets of Dublin, provides a deeply personal perspective on the atrocity. Designer Rachael Rooney’s blown-out shell of a building provides the ideal platform for each shard of this fractured history to unfold, while Gemma Kerr’s subtle direction underlines the isolating effects of the conflict on the community.